Thanksgiving is filled with opulence: the food – both quantity and quality – the family, the leftovers, the flavors, the fun… the wine. But the Thanksgiving holiday can be a challenge when it comes to wine selections and what to pour for guests. With so many side dishes, mixes of flavors, and lots of savory and sweet combinations, wine pairing can be difficult for the host. 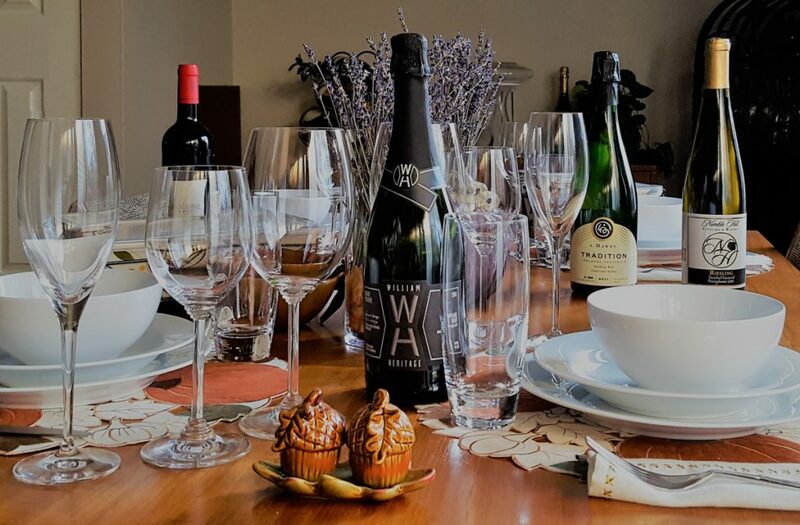 Unless you are planning a course-by-course wine dinner, finding one or two wines that all of your guests will love can be a daunting challenge. If you’re tasked with bringing wine for Thanksgiving, here is what I would suggest. Every time you are in a difficult food-and-wine-pairing situation, sparkling wine can become your best friend. The carbonation in sparkling wine gives this style an edge when it comes to food pairing, and it can go with almost anything. From appetizers to the end of dinner, sparkling wines offer a plethora of options. Bonus feature: there are a lot of good sparkling wines out there that will not break the bank. Consider Prosecco, a fruitier sparkling wine produced in Italy. If you have a sweet tooth, bend towards Asti, the Muscat (Moscato) grape that is produced in a sparkling style and also from Italy. If you like more of the biscuit or bread-like flavors associated with traditional Champagne, try Cava, which is produced in Spain. Cava is not quite as fruity and vibrant as Prosecco, but it will also keep you from spending $40+ like you would on a bottle of Champagne. Bouncing back towards bubbles, the local wine industry (wherever you may live) is a great place to browse for sparkling wine selections. Many wineries across many states are making sparkling wines in a number of different styles and sweetness levels, and using a number of different grape varieties. In my travels, I’ve found great sparkling wines produced from grapes grown in Texas, Michigan, Virginia, Maryland, New Jersey, Pennsylvania, and New York! If you need a “local” suggestion, ask me on Facebook or check out some of my past wines on Instagram! If I’ve previously traveled to the wine region, I’ll definitely help you find a decent wine. Personally, I’ve found Riesling to be quite versatile during the Thanksgiving meal. The best part is, if you are purchasing a few bottles, you have the opportunity to purchase both dry and sweet Rieslings, which will accommodate all of your guests. Many New World Rieslings will list how sweet the wine is on the back of the bottle. Yes, it can be completely intimidating to know how to pronounce these words, but don’t fret. These words simply describe the level of sugar ripeness and maturity that the Riesling grapes were picked at during harvest. Kabinett is the “least ripe,” while Trockenbeerenauslese is the “most ripe” or containing the most sugar at harvest. If you see “halbtrocken” following one of the three terms, Kabinett, Spätlese, and Auslese, that means the wine is off-dry, or has a little bit of sweetness. If you do not see either of those two terms within those three classifications (Kabinett, Spätlese, and Auslese), you can usually assume the Riesling is sweet. Both Berenauslese and Trockenbeerenauslese are always sweet, but also delicious and full of bursting flavor. Beaujolais Nouveau is not often recommended by wine enthusiasts, but this is an easy selection that comes out right before Thanksgiving (released the 3rd Thursday of November in the U.S.) that consumers tend to enjoy. Beaujolais Nouveau is made in the French region, Beaujolais, using a special processing technique called “carbonic maceration.” This technique ultimately alters the wine style, and provides a candied, fruity, sometimes banana-nuanced, light-bodied red wine marketed and labeled as Beaujolais Nouveau. It is the type of wine that is purchased in November and should be consumed before New Year’s rolls around. This is not the type of red wine that will benefit from any long-term aging. Another option could be to purchase a Beaujolais or Beaujolais-Villages, which is typically made with the red grape variety, Gamay. What’s lovely about Gamay is that it tends to be less tannic and astringent compared to wines made with more familiar varieties like Cabernet Sauvignon. That softness associated with Gamay wines may be the perfect combination with the turkey and Thanksgiving trimmings for those that enjoy a red wine during the main feast. If your family is like my family, then [wine] variety is key! My Thanksgiving go-to wine-buying solution is to provide a series of wines I think the group will enjoy that have absolutely nothing to do with the Thanksgiving meal. In other words: buy what your guests like. These are perfect wines to enjoy while dinner is being cooked (of course, drink and cook responsibly) or while watching the big game on TV or socializing with relatives. There are no hard rules for what to drink with the Thanksgiving meal, and ultimately, I usually recommend that people drink what they like. After all, it is a holiday meant to be enjoyed! If you have special wines selected for the dinner, make sure there is enough to give everyone a taste. Usually one bottle of wine equals five servings (i.e., five glasses of wine). At the very least, this will give you an opportunity to discuss why you chose the wine for the main meal.